Does Innovation Lie Beyond Software? Today, it is fashionable to suggest that innovation lies beyond what is common. But perhaps innovation lies in seeing the familiar in a new way. In the beginning, there was hardware. But hardware soon tired of its single purpose flip-flops, NAND gates and 555-timers. It longed for a playmate, something to give its existence greater meaning. In desperation, hardware called upon the great architect Von Neumann for help. 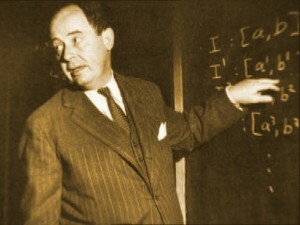 Being a compassionate yet playful deity, Von Neumann created software. For a while, all was good. But in time, software grew beyond hardware. Basic firmware evolved into operating systems and eventually application programs which were completely detached from the hardware. For its part, hardware was happy because it could do so many more things than before. But the two wares seemed to be growing apart. Pleased with its detachment, software soon found that it could model hardware. This capability created an entirely new industry called electronic design automation (EDA). Modeling enabled an architectural idea known as reuse which led to the business of intellectual property (IP). Software enjoyed its new life until something terrible happened. Hardware became commoditized – cheap, standardized and very reliable. Once that happened, software began to feel lonely and bored. In despair, it called upon the old architect for a new playmate. But Von Neumann had been replaced with a polymorphic-being known as the Consumer. This rather vague and easily confused architect didn’t care about hardware or software. It only cared about the experience provided by its interaction with both hardware and software. It seemed as if neither software nor hardware were as important as before. Software sighed, wondering if there was something beyond it. Would software – and maybe even hardware – have to serve a different purpose? Software decided to model this problem. How could the wares provide the experience sought by the Consumer? According to the model, familiar concepts such as power, performance, size and cost would be critical factors in achieving this experience. This, in turn, meant that software and hardware would have to work together in ways that they had never done before. Finally, software understood. To achieve the experience desired by the Consumer, software and hardware would have to innovate, i.e., to play together in new and different ways. This realization pleased software very much. But before telling hardware the good news, software thanked the Consumer for making its life more interesting again. Unfortunately, the Consumer had already become bored and was busy inventing blended reality. But that’s another story.